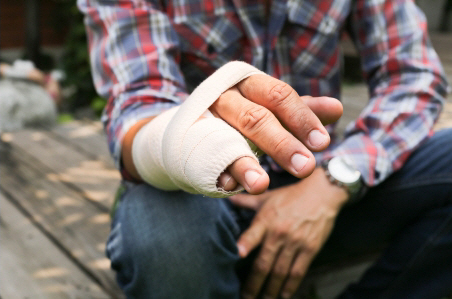 If your break is unstable, displaced (the broken ends are not together), involves the joint surface, or pulls off an important ligament you may need surgery. The surgery will be done by a specialist hand surgeon – it may be an orthopaedic (bone) surgeon or a plastic surgeon. The precise surgery you have will depend on what type of break you have – your surgeon will discuss this with you, including the risks and benefits of surgery, and how you are likely to recover. Whatever surgery you have, it will involve some metal (a plate, screws, or possibly wires) to align your bone properly and support it while it heals. Surgery usually involves spending one night in hospital, and your finger will be in a splint for up to six weeks. You will need at least one week off work after surgery. Whether you need longer depends on which hand is affected – you will need longer if the break is in the hand you use most (your dominant hand). It will also depend on what your job involves, and whether there are any light duties you can do. You won't be able to carry or lift anything for about two months. You will have a course of physiotherapy to strengthen your hand and get it moving again. As you recover you will have regular appointments with your surgeon, and some X-rays, to make sure your finger bone is healing well. If wires have been put into your broken finger they may be buried under your skin, or they may be poking out from the end of your finger. They will probably have to be removed. Most often they are poking out from the end of your finger and will be removed at a clinic appointment. This is not usually painful (a bit like having a blood test), but it's a good idea to take some pain relief before you come to this appointment. If they are under you skin you may need another operation to remove them. While you are recovering, avoid lifting or carrying anything on your injured side. You should also avoid any sport or any other activity that could make your injury worse. Your surgeon will let you know when it's safe to do these things again. If wires are poking out the end of your finger, it's important to protect them, so they don't get caught on clothing or are accidentally pulled out. If this happens it can be painful. You may also need more surgery to put them back in, which can affect how well you heal and how well your hand works in the future.